Day Three at the Desiring God conference was a shorter day, but a great way to end the conference! Overall, this was a good conference. The theme was woven into all of the sessions, but it seemed like it might have been a bit overdone, or stretched a bit too far. Today was probably my favorite day, with a session by Ramez Attalah with a focus on evangelism, and then a panel discussion with questions from the audience. What a great session! This was one of my favorite sessions in the whole conference. Ramez is serving as the general secretary of the Bible Society of Egypt and shared some great insights on what is happening in Egypt right now, as well as a detailed history of Christianity in Egypt and finally some leadership principles we can gain from his experience. He started with a fascinating story of how John Mark was the first missionary to Egypt in AD 43, after he had been written off by Paul. He shared how Egyptians were involved with the spread of Christianity at the Council of Nicea, and other important contributions. John Mark went back to Egypt but was martyred there. Even though Egypt was one of the first Christian nations, the country eventually became mostly Muslim, with now only about 10% Christian. A Scottish missionary, Rev. John Hogg, came to Egypt to revive the Coptic Orthodox Church in Egypt back in the 19th century. He wasn’t received well by the Coptic church, thinking he was coming to force their religion on them. There was a man named Tanassah that the Coptics had hoped would argue against the missionaries for them, because back then the priests in that church were not well educated, but he actually hosted them in his home, and began to support the missionaries. He was excommunicated from the orthodox church, and became the first elder in the new Protestant church. Tanassah became a missionary and his goal was to regain the orthodox church. The Coptic church saw what the Protestant church was doing to reach the people, especially with the kids, and decided to host their own Sunday School, a new concept for them! They needed teachers, so they had their brightest students actually open and read the Bible themselves, another new concept, in order to teach the kids. These Sunday School teaches eventually became revived and made alive through the Scriptures and the Orthodox church had its own revival through them. So the two churches – the Protestant and the Orthodox churches existed separately, but side by side, as it is to this day. Ramez then told his story about how he grew up in Egypt in a small Episcopal church, but had no relationship with Jesus. His grandfather took hold of him and plotted a course for his life, since his grandfather had no sons of his own, only daughters. He wanted his grandson to carry on the family business of engineering. Because of turmoil in Egypt he fled to Canada with his grandparents when he was 16. His grandfather soon died, and grandmother left the country, so he was left alone to fend for himself there. He went to college there, was saved while there, and began to work with InterVarsity reaching the campus for Christ. He had a burden, though, for Egypt. So 18 years later, went back to Egypt with his wife (American turned Canadian) and two children. He had a burden to reach the youth of the Protestant church there by the use of inductive Bible study. By God’s grace, he ended up being accepted in both the Coptic and Protestant churches, and allowed to teach them how to study the Bible, and my doing that, many people were saved. He eventually became the director of the Bible Society in Egypt and works to this day distributing tracts and Bibles to people there, reaching that country for Christ. He shared some very creative ways they work within the laws there to accomplis this task. He spoke of the recent revolutions there in Egypt, and how now the people that are the most in danger are the moderate Muslims; the Christians will probably be left alone, but yet many want to emigrate and many already have left. Then he connected the dots for us, and shared the big picture of how God works. When he went back to Egypt, he found a family picture, and in it was his great-grandfather. He was holding a Bible, which was quite unusual in that day. He shared with us that he discovered his great-grandfather was none other than Tanassah, the man who had helped start the Protestant churched in Egypt many years ago, and was one of the first missionaries there to reach the orthodox church. God’s plan wasn’t for him to be the heir of his grandfather and take over his business. It was to be the heir of his great-grandfather, Tanassah, and spread the news of Christ to both Protestants and the Orthodox church. Amazing! About this, he said that some have a sense that we need to be fulfilled by using our gifts, but God never promised that we would be in a place where we can use all our gifts. God calls us to a mission, and then asks us to muster any gifts or skills we need to accomplish that mission. We may have to say “no” to other gifts we have. Where God has put me is more important than the gifts He has given me. He develops the gifts/skills in you to accomplish the task He has called you to. He concluded with an amazing story of a garbage village in Egypt; a village that is actually built on a garbage dump, and all the families there are garbage workers. They live among the garbage. It’s a very dirty place, and people living there feel like they themselves are garbage. His wife, Rebecca, felt a burden to reach that community, and along with the Coptic priest that was assigned to that area, began to work on reaching that village for Christ. Amazing things happened! A church was built, a school came to be, and kids and families were reached for Christ. The housing and public services improved. The priest wanted to build a cathedral, so he excavated the mountain right next to this village, and built a huge cave church. It has now become the largest church in all of the Middle East, seating about 15,000! 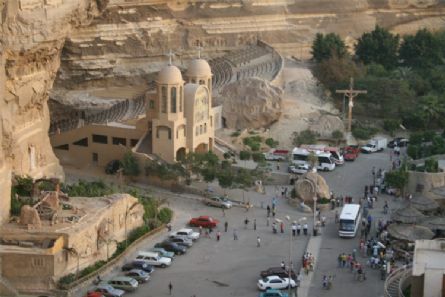 On 11/11/11, they held a service combining Christians from both the Protestant and Orthodox churches for a time of worship in these cave churches. Over 50,000 people were there lifting up the name of Christ amidst this time of turmoil in Egypt. At one point during this 12 hour “Night of Prayer and Return to God”, this huge crowd shouted the name of Jesus for 10 minutes straight! This was an amazing story of God’s redemption and how He is at work all around the world! This final session brought back all of the speakers for one last time to answer questions submitted by conference attendees. There were several questions that asked the speakers to dive deeper into topics they brought up in earlier talks, and some other general questions. Several of the questions dealt with this main topic of masculinity in the church, like “What is Biblical femininity?”, “Advice for fathers of daughters?”, and “Disciplining Foster Children?”. One of the questions that received the most time was “How to balance strictness with grace?” which led to a good discussion between John Piper and Doug Wilson, mainly, about the role of anger in discipline. Wilson maintained that when you are angry at your child for what he/she has done, you are not then qualified to discipline them. You need to wait until emotions have settled before carrying out discipline, so as to avoid disciplining out of anger. Piper didn’t disagree with that, but just added that it’s good for kids sometimes to see the righteous anger that should accompany severe infractions of the family rules, such as disrespecting mom. All agreed that anger itself is not bad, but that there needed to be control and it should not be motivation for discipline. The next line of questioning had to do with worship, which I was glad to hear. Doug Wilson was asked to clarify a point he made about how corporate worship is an attack on the culture. His main point there was that when we gather to worship the Father, we are basically saying to the leaders of this world that there is a higher power that you have to answer to. They don’t want to hear that, and it is threatening to them. There was also a question about how music lyrics now can be somewhat “feminine”, and how to reconcile that with our discussion about masculinity in the church. Piper acknowledged that, and said there needs to be a balance. There should be a strong feel to worship, but we also need to realize that it is masculine to be emotionally engaged about the love of the King. The session wrapped up with questions about who you should have around you to challenge you and help you move along in your walk, and finally encouragement to fathers who have grown children or older kids and who have not been good fathers so far that it’s not too late to change, or to fix relationships. We just need to be honest with kids, acknowledge what we’ve done wrong, and keep walking into tough situations, not away from. Day Two at the Desiring God Conference for Pastors was an extremely full day, and my brain is a bit on overload right now. But, I’ll try to give you a recap of the main points from each speakers. It was a full, but very good day! One more day tomorrow. You can watch the live-stream of Wednesday’s activities here. This was such a good session on fatherhood! It made me want to just go home and hug my kids! Crawford Loritts is an excellent speaker, and really did a great job! He started with a short biography of his father, who he said was the greatest man he’d ever known; and by great he doesn’t mean famous or well-known, but staying power, integrity, nobility, never walking away. He told a bit of his history, how his great grandfather was a slave, and how through the generations this idea of responsibility, pressing in, courageousness had been passed down. In his talk, he described four stages of any man’s life, four big lessons from his father, and then a bit from Galatians 5 on how the Holy Spirit transforms us. In this conflicting time, they define manhood often by thinking it’s being able to do whatever they want. Arguing with parents just wasn’t allowed. I had not heard of Darrin Patrick either, but he gave another powerful message from Galatians 5 and the fruit of the Spirit. He reminded us about the power of the Holy Spirit to change and transform lives. Specifically at this conference, how He can change men into men that honor Him in everything we do. He wants to produce fruit in us, but he does it in counterintuitive ways. There is always going to be a struggle in you between wanting to do the right thing, then fall short, then repent and forgiveness. It’s actually a good sign that the Holy Spirit is as work in you – you are a Christian! To know if the change is because of behavior modification or the Spirit, just ask – who am I impressing? Those who know you the least or the most? The ones who know you best will know. Change doesn’t just happen overnight. Remember – we are as loved and accepted by the Father as Jesus is. We benefit from His sacrifice. We are treated as righteous as Christ. Each year, John Piper highlights the life of a person from history, and challenges us from his life. This year, he highlighted English preacher J.C. Ryle, best know for his book “Holiness”. It was an interesting look at this man, and the eight characteristics of a masculine ministry that he pulled from his life. I won’t take the time to go through because he said his entire manuscript would be available on the Desiring God website, so you can read the entire talk for yourself, if you’d like. This was the last session tonight, and maybe it was just because I was tired, and my mind was already full from a day of learning, but I had a hard time following Mr. Wilson tonight. I’m sure what he had to say was right on, but I had a hard time pulling out the main points. I’ll try to give you an overview of what he said, however. The overall message was how the church needs fathers in the church to be leaders and teachers in the church. But, we can’t let the teachers get in the way of our relationship with Jesus. They should be windows we look through to see Jesus, not murals we stare at. He talked about how we’ve neglected the role of the Father in the Trinity in our worship and in the church, focusing more on the Son (Evangelical) and Holy Spirit (Charismatic). But we need all three. Children imitate their fathers;it’s part of God’s design. The church needs fathers who imitate God the Father. We used the Paul Baloche version, along with a the click track from Praise Charts. I like the Baloche version better than the original by Brewster! They’re both great, but this seems to be a bit more congregationally friendly. I used Psalm 55:22 to introduce the song. 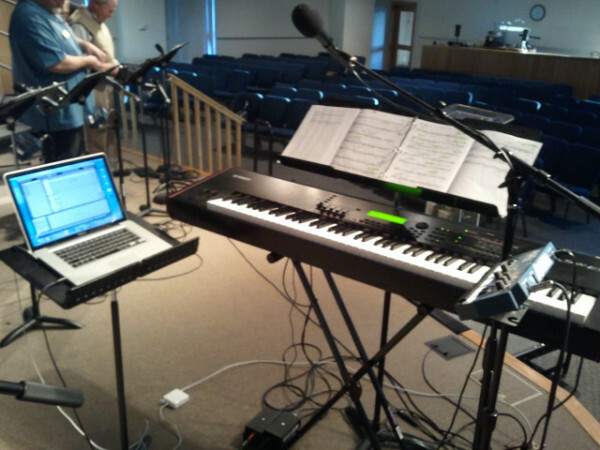 All of our arrangements this week were from Praise Charts, and we used the click track for all the songs. Our team has really settled in nicely with using click tracks! All four songs today just felt so comfortable and tight with the clicks! We changed up the harmonies a bit on this song today, since we had the full worship choir. If you’re not familiar with this one, check it out! It’s on Matt Redman’s latest CD, 10,000 Reasons, and is such a powerful anthem! I love the progression of the lyrics in each verse, from “what eyes” to “our eyes” to “all eyes”. We introduced this song last week, and already people seemed to know it well and sang out. What a great morning of worship! We had a huge turnout in our worship choir today, even two of our pastors sang with today! We actually had more guys that we had ladies today, for the first time! It’s so cool to see that ministry growing and new people added! Pastor Tim continued his series on revisiting our vision statement at the start of a new year. We talked about “Grow”, the second part of our discipleship process – “Connect, Grow, Serve, Go”. You can watch the video of this service and see the Planning Center details. Zack led the team in the Cafe this morning, and picked out some great songs. Janet sang for the first time, and it’s great to have her part of this team! You can see the Planning Center details for this service. You can watch the video of this service and see the Planning Center details. This post is part of the Sunday Setlists blog at The Worship Community, where worship leaders share their setlists and recaps from today’s services. Thanks for reading, and I hope your services went great today!